Stunning launch desingned and built by Camper and Nicholson in 1912 as a fast yacht tender for the ground breaking racing yacht ‘Istria’, also built by C&N. It was common for the big yachts to have small fast tenders to ferry crew and guests out to the yacht which would often be anchored off the harbour. All these tenders had lifting eyes fore and aft in order to be hauled on deck and set in chocks. There is some evidence to suggest this launch was requisitioned by the military and used at Dunkirk to evacuate troops from the beach. Beautiful lines with a touch of tumblehome on the transom, subtle sheer line and a nice flare to the bow. She has been undergoing a steady refit over many years and several owners. Some of which have done more for her than others. The current owner has done some very good work and likely saved the boat from a sorry end. She now needs a new enthusiastic owner to take her on and finish the project. Planked in full length Honduras Maho gany, fastened with copper nails and roves to light steam bent timbers at 5” centres. The construction was designed to be lightweight as the boat had to be fast and easy to haul up on the deck of the big yacht. Some replanking has been done around the aft end where the bronze A-bracket has pushed through the hull at some point. This is part of the evidence of her use at Dunkirk, where one soldiers account describes them jumping into a small boat matching the description of this tender. He explains that as they all jumped in she was pushed down in the water and bottomed out on the sand, causing planking to be damaged and a serious leak to start. New teak floors fitted in way of the engine space. Copper straps fitted on many of the timbers to replace the original bronze straps, most of which were broken. The exterior of the hull has been sheathed in West System epoxy and glass cloth. The decision was taken to do this to preserve the boat as best as possible. Her hull was dried, stripped and prepared, and the result is a very strong and lightweight boat. 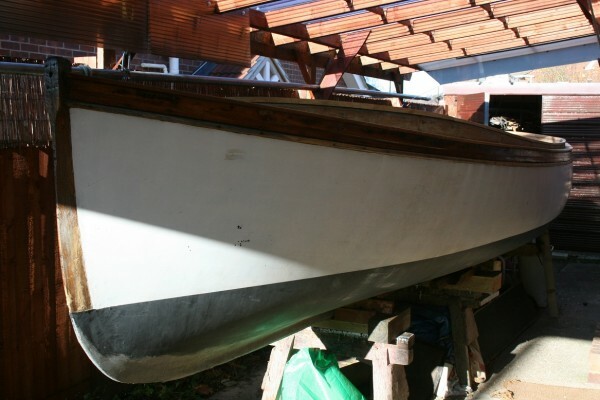 Although not traditional, this action will probably preserve the boat and make her usable for many years to come without having to replank and refasten large parts of the hull. There is no engine with the boat but she would suit a modern lightweight diesel. The work has been done to strengthen the hull in the area of the engine, but nothing more has been done towards the installation of a power unit. Many original bronze fittings with the boat including fuel tank, propeller, A-bracket, rudder and tiller, cleats, fairleads, wheel and steering cable sheaves. This is a stunning little launch from another era, with a vast amount of history to go with her. If only boats could talk!